Awaiting The Apocalypse In The Quiet Town Of Concord Ben Winters' mystery novels are set in the capital of New Hampshire, a community hardly known for its crime or intrigue. The twist? In his books, the planet is about to be hit by an asteroid, and everyone knows they're soon going to die. Amid the chaos, one Concord cop fights for law and order. 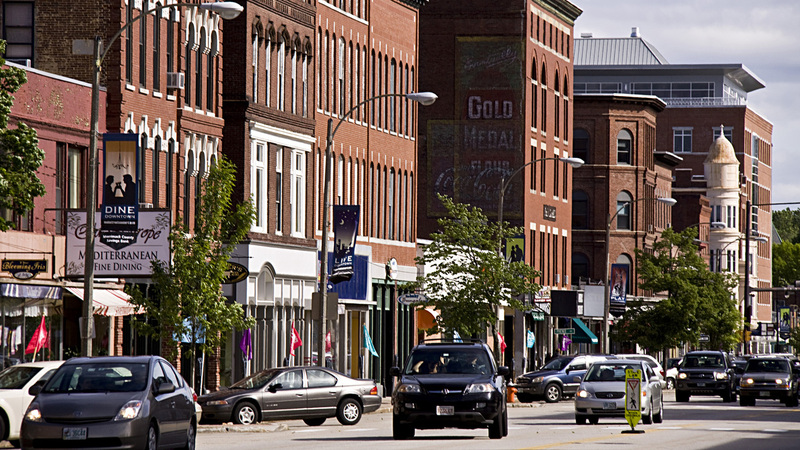 The view down Main Street in Concord, N.H., reflects the community's small-town feel. Author Ben Winters doesn't live in Concord, but he sets his mystery novels there — he says the city's peaceful, unpretentious atmosphere makes it an appealing setting. No place seems safe these days from someone's terrifying, post-apocalyptic imaginings. Los Angeles is wrecked in the movie Elysium, the South is zombie-ridden in TV's The Walking Dead, and now— thanks to writer Ben Winters — even the quiet streets of Concord are at risk of annihilation. But it's hard to imagine anywhere less apocalyptic than the Corner View Restaurant in Concord, N.H. The cheerful diner is full of morning sunshine, happy families and yummy pancakes; but in Winters' Concord mystery novels, which so far include The Last Policeman and Countdown City, the earth is about to be hit by a giant asteroid. That means this little diner on South Street, like the rest of the planet, is headed towards destruction. But during the last few months before the end of the world, Corner View keeps serving. It's a recurring location in Winter's books. "It's the place where Detective Palace goes with his buddies to hang out," the writer explains. Hank Palace, the detective at the heart of the series, is well over 6 feet tall, only 27 years old and completely obsessive. He's one of the very few detectives remaining in Concord since the world learned about the asteroid. Other cops have deserted their posts to party in places like New Orleans during the final months before the earth is destroyed. Palace comes to this diner for coffee — or, at least, he used to. "You can't get a cup of coffee anymore because of the slow disintegration of infrastructure and agriculture and international shipping, with everybody leaving their jobs and the world falling apart," Winters says. Winters refashions noir tropes to suit his pre-apocalyptic stories. For example, now that the world is about to come to an end, nearly everyone's started smoking. "The cigarettes, the mysterious women, the cops, late night at the diner," Winters says with some relish. It's all there. He's purposefully playing with noir archetypes: His hero, for instance, is the man who cares when everyone else has given up. "That is a familiar type for mystery fiction," Winters explains. "But I was like, 'But wait, what if really nobody else cares and what if there's a really good reason for that? You know, what if no one else on the Concord police force cares because the world is ending?' "
So, how do actual Concord police officers feel about how they're portrayed in Winters' books? When the author visits the local station, the cops are mad — mad that he forgot to bring them signed copies. Crammed into a tiny blue interrogation room, two of Concord's finest, Lt. John Thomas and Officer Ryan Howe, consider the notion of policing a world on the brink of annihilation. Howe is sober: "You imagine the chaos that would be. You'd have people that leave to be home with their families, but I bet you'd have people stay." In the books, the economy craters — first slowly, then very fast. Police work becomes about maintaining order, not solving crimes. Missing people are often assumed to be off pursuing a last-minute bucket list, and those who stay and try to hew to some semblance of normal society tend to be librarians, hospital personnel and law enforcement officers. Howe and Thomas aren't sure how they'd respond to the end of the world. "We were talking about it upstairs," Howe says. "Jeez, what would we do? Jeez, I don't know. ... I might be home with my family, if you had 70 days left." It's a pretty far-out question, especially in a town that rarely sees even one murder in any given year. That's not to say Concord hasn't had a brush with sensational crime. "There were these Toothbrush Twins that escaped from Alcatraz," Howe says. Actually, it was an Iowa prison: In 1945, two desperadoes busted out of a Council Bluffs jail using toothbrushes and embarked on a cross-country crime spree. "They were both captured here in Concord, N.H." Howe says. This town's anodyne peacefulness is why it appealed to Winters as a setting. He doesn't live here, but instead came to appreciate Concord through his brother, Andrew Winters, who moved here 13 years ago to work as a public defender. His law office near downtown comes with a not-so-sophisticated alarm system: just a bell over the door. Winters' brother verifies Concord's status as a non-hotbed of crime. Ben Winters wrote the best-selling Sense And Sensibility And Sea Monsters, as well as Bedbugs, Android Karenina and several books for kids. So far, he's published two books in the Last Policeman series. 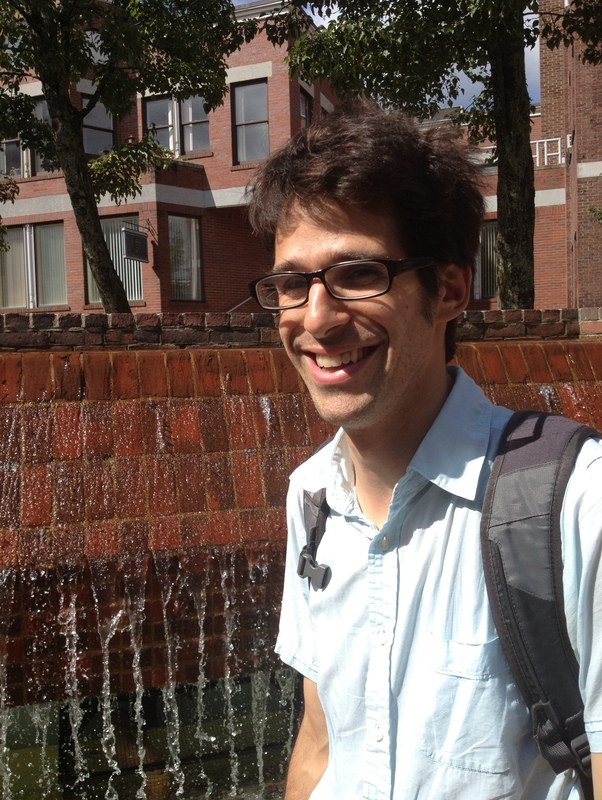 "Concord is, by all objective standards, not a particularly exciting town," he says. "It's a family-oriented town." Andrew Winters says his Concord friends are pleased and mystified that his brother set his series here. "The typical reaction ... of people in Concord," he explains, "is, 'Why Concord?' "
The author says it's because Concord is both specific and universal. It's an unpretentious New England town that in some ways could be almost anywhere. There's wealth, there's poverty, there's a middle class and it doesn't feel fake. Winters explains that there are a lot of New England towns, particularly on the coast, that have embraced a sort of preciousness — they have a lot of candle and taffy shops. "Concord doesn't feel like that at all to me," he says. "It feels very much like an active place, which probably has to do with the state government being here." The state is also known for a certain set of politics. "The libertarian thing is very real," Winters says. "The 'Live Free or Die' thing is very real. There [are] literally people who move here for the purpose of taking over the government and doing away with it." And that resonates with a pre-post-apocalyptic story about the slow, stripping away of government, regulations and the institutions that hold society together. Downtown, at the intersection of State and Blake, you can see five or six solid blocks of respectable red brick buildings, well-kept and occupied. There's the hardware store that, in one of the books, jacks up prices every week for increasingly rare basics like lightbulbs and shovels. There's an office building that, in Winter's vision, gets covered in graffiti reading "Lies, it's all lies." Then there's the dive bar hidden in an alley. In the book The Last Policeman, this is where Palace comes to drink when no one else believes a seeming suicide is actually a murder. After all, suicides have become a depressing norm. "And on the jukebox someone has ironically put on the R.E.M. song 'It's The End Of The World As We Know It,' and the Tom Waits song 'Earth Died Screaming' and the Elvis Costello song 'Waiting For The End Of The World,' " Winters says. "I have this sort of moment where they're sitting at the bar and he's like, 'Everyone is taking this like a big joke.' "
Palace is clinging to justice so desperately that in the months and weeks before everyone dies, he's still tracking down missing people and investigating homicides. "There's something about him ... [and] his rigorous, unironic belief in law and order, and his rigorous, unironic mustache, and his rigorous, unironic belief in making promises and keeping them," Winters explains. "It's a very old way of looking at the world." It's a sort of faith that heroes of detective novels fundamentally share in every city, setting and era. They're the ones who make you think, even as the Earth's demise looms, that hope for humanity is not entirely lost.